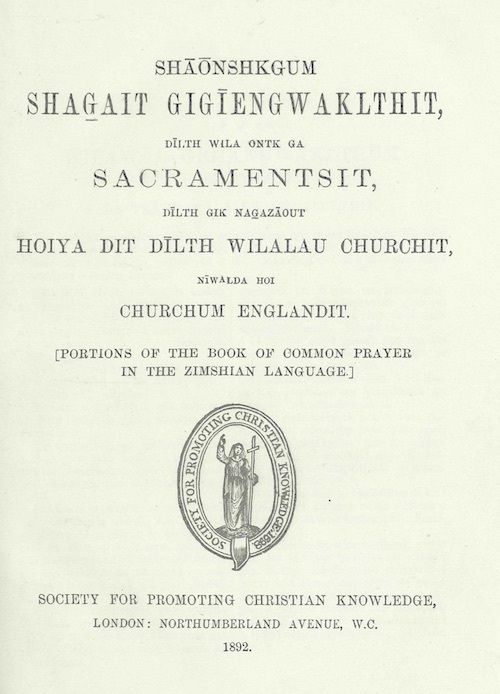 Shāōnshkgum shag̲ait gigīengwaklthit, dīlth wila ontk ga sacramentsit, dīlth gik nag̲azāout hoiya dit dīlth wilalau churchit, nīwalda hoi Churchum Englandit. Portions of the Book of Common Prayer in the Zimshian Language. Tsimshian or Zimshian, called Sm'álgyax by its own speakers, is an endangered language spoken by about 200 persons in British Columbia and Alaska. This translation was prepared by Jane Ridley (died 1896) and the Right Reverend William Ridley (1836-1911). He served as Bishop of Caledonia from 1879 to 1905. The Ridleys' 1882 translation is also available online. David Griffiths identifies this translation as 198:2 in The Bibliography of the Book of Common Prayer 1549-1999 (London: The British Library; New Castle, Delaware: Oak Knoll Press, 2002). This text was digitized in July 2017 by Richard Mammana.